There are several 3D modelling software applications. They are used in construction, architecture and engineering-related areas, including rapid prototyping. 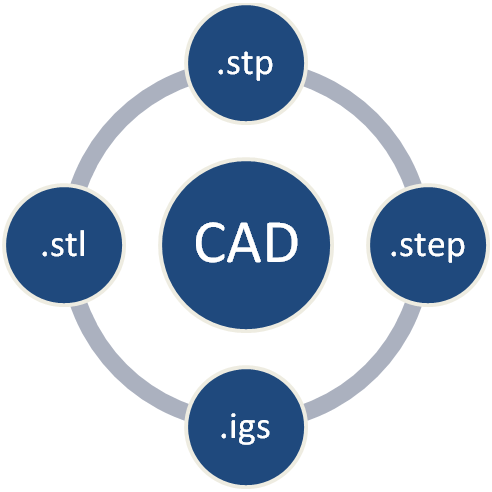 Differences between software and file formats: In rapid prototyping, we use software called CAD (Computer-Aided Design). It supports production formats such as stp, step and igs and design formats like stl. These formats were developed by the software vendors. For example, dwg and dxf are industrial formats of AutoCAD. The information that can be modelled in the 3D files depends on the extensions. Thus, the data present in the dwg formats is relatively limited. The software most frequently used in prototyping includes: SketchUp, AutoCAD, SolidEdge and SolidWorks. Applications: In addition to allowing the visualisation of the inside and outside of the parts, their spatial manipulation and measurement of dimensions, the software also offers various applications. For example, it is possible to displace and separate certain elements and zones of the parts or calculate angles to better analyse the feasibility of projects. Production: The 3D software files are used to produce the parts. They give instructions to the machines to direct the movement and rotation of the milling machine in CNC machining and the alignment of the resin layers in 3D printing. Limitations: However, this software allows only simplified representations of plastic parts. It is generally idealised and does not take account of a number of physical elements of the real world and mechanical stresses. Consequently, the numerical representations are not necessarily conceivable in 3D. Thus, the assembly of parts in a 3D file is not necessarily feasible in reality if the gap between the parts does not allow them to be inserted. On the other hand, a wall that is too thin or a diameter that is too large in a relatively long part results in a high risk of fragility and breakage. It is therefore necessary to adapt the 3D files to the realities of the physical world and the production constraints.